His Eminence, the Most Reverend Miron (Chodakowski) of Hajnówka was the Archbishop of Hajnówka and Orthodox Military Ordinariate for the Polish Army of the Church of Poland, Vicar of the Diocese of Warsaw and Bialy. He was killed in a tragic airplane crash in Smolensk, Russia with the Polish president, his wife, and many officials of the Polish government on April 10, 2010. Miroslaw Chodakowski was born on October 21, 1957 in Bialystok, Poland. After completing his primary eduction in Bialystok, Miroslaw entered the Orthodox Seminary in Warsaw in 1972. In 1976, he became a student at the Higher Orthodox Seminary at the Monastery of St. Onufry in Jableczna. After graduating from the seminary, Miroslaw remained at the school as a teacher and school official. On December 17, 1978, he was tonsured a rassaphore monk with the name Miron by Archimandrite Sava. On December 26, 1978, the monk Miron was ordained a deacon by Metropolitan Basil who also ordained Dn. Miron to the priesthood on February 15, 1979. In November 1979, Hieromonk Miron professed his vows and was raised to the rank of the little schema. Later in the month, Hrmk. Miron was assigned to the monastery as the local parish priest, and vice rector of the Higher Orthodox Seminary. In June 1984, the Council of Bishops of the Church of Poland elevated Hrmk. Miron to Igumen and also assigned him to the clergy of the Diocese of Bialystok-Gdansk. During the following October, Igumen Miron was appointed the parish priest in Orthodox Suprasl area where parts of the monastery and parish facilities had been returned to the Orthodox Church. As the Monastery of Suprasl began to be restored during 1984, Igumen Miron was assigned as prior to the monastery. In 1990 he was elevated to the dignity of archimandrite. 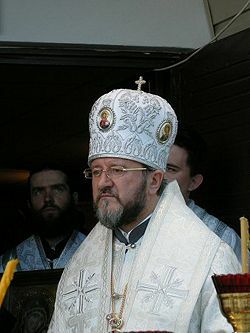 On May 10, 1998, Archimandrite Miron was consecrated Bishop of Hajnówka and given the duties of the Orthodox ordinariate of the Polish army, with the military rank of brigadier general, bestowed on him on August 15, 1998 by the President of Poland, Alexander Kwasniewski. He held this position until his death. In 2003, Bp. Miron was granted a Doctor of Theology degree in the field of Church History by the Christian Theological Academy in Warsaw. On May 10, 2008, at the military parish of Biala Podlaska, Bp. Miron was raised to the dignity of archbishop by His Eminence Metropolitan Sawa of Warsaw and all Poland. On April 10, 2010, Abp. Miron was a member of the Polish delegation enroute to a memorial commemoration of the seventieth anniversary of the Kaytn massacre during World War II. The delegation included prominent members of the Polish government including President Lech Kaczynski, his wife Maria, and prominent members of the parliament, ministers, other officials. Their airplane crashed while attempting to land in heavy foggy, with no survivors. The commemoration ceremonies were to include the laying of the cornerstone for an Orthodox Church at the sacred place - Kosogory - near Smolensk. On April 20, 2010, Abp. Miron was buried in the crypt of the Church of Annunciation at the Suprasl Monastery, of which he was the Father Superior. He was fifty three years old at the time of the tragic accident. This page was last edited on March 17, 2012, at 02:01. This page has been accessed 9,062 times.